I decided I wanted to start a new series. I’m not sure which day of the week this will end up, but I have a huge obsession with Pinterest…I mean HUGE! I have 1,000s of pins in just my sewing projects board! Here is my first installment of the Pinned it – Did it! series. The American Flag T-shirt. I made this for my baby girl, Scarlett, on the 4th of July, but since I’ve been a loser in the posting department, you’re getting it at the first of August! I have no idea where the original pin came from…the one I pinned is just a pic, with no tutorial or even where to buy, so I had to make my own tutorial. 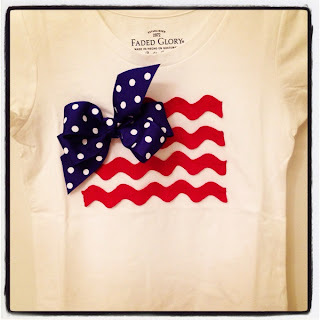 I started with a kid’s t-shirt, red large rick rack and polka dot blue grosgrain ribbon. I cut 1 short strip and 2 longer strips of the rick rack, just eyeballing it. Since this was for a 10 month old, I had to size it down. The original pic has 4 strips of rick rack. After I had them where I liked, I pinned and sewed them in place. Filed Under: Blog, Pinned It - Did It!